Cool, thanks for the update... they look so much better than those plastic disks. I have waited on receiving my stainless steel spikes from Meridian to complete my original order first before announcing some disappointing news. Meridian has informed a dealer, who informed me with a PM, that he was told Meridian will no longer supply the retrofit stainless steel cups and spikes. I can only assume that the margin on these for Meridian is miniscule and that the associated administration in dealing with the orders and then the delivery to the dealers, is not worth their time. Sounds a similar story to stopping the online access to firmware updates, where they found after getting the customers to deal directly with their dealers, they saved considerable time on their support line previously spent helping customers trying to do updates themselves. There must have been a several of us that did get their order in before Meridian intervened though, which is still a plus for those who acted quickly. Well done on getting in quick, surely this comes under customer service/relationship? Seems to be a mystery to Meridian these days, I always thought they could and probably should have been part of the SE upgrade. I totally agree with you that for the relatively small added cost, it would have been a no-brainer to have included the SE feet in the upgrade package. Oddly my new spikes came in a bag marked Ruby 8000 spikes. I looked at the photo of the 40th Anniversary Ruby Edition on Duncan's Meridian Info and the SE cup and spikes are clearly seen in the photo so they were out earlier than we realised. Correct. They are on the Ruby 8k. The photo of the Ruby edition speakers for everyone's benefit. If there is a real requirement for the upgrade feet for the head, a group buy should be organised to get some made by a bespoke machining company, the design is simple enough and they could probably be had at a much cheaper price. On a separate note, those 8000 base feet always look wrong and in my option ruin the aesthetic; big in the front and small in the rear, like a cheap 80s midi system from Amstrad. 8ks rest on 3 large identical feet ... those small “feet” don’t normally touch the floor unless the speaker is knocked and tips over to one side. I agree they could be prettier mind. The rear 'stubby' feet can be removed (at owners risk obviously) I seem to remember ncpl removing his on the recommendation of two trusted individuals? 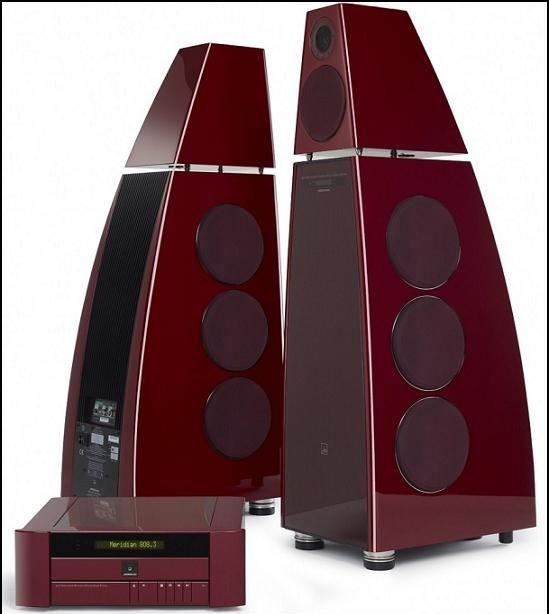 I guess so, the speaker design is 18 years old now. Correct... I took the little stubby feet off. The 8k are very stable on the 3 main feet. It takes quite a push to get them to tilt.